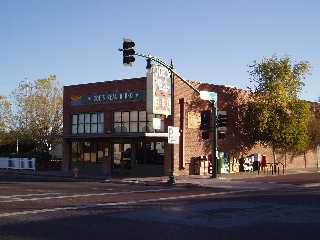 Joe's Real BBQ is right in the heart of old downtown Gilbert, across from the modern Hale Centre Theatre. Go south on Gilbert Road and when you get to the slow part you are just about there. See map below. This place is an experience! The first thing you notice is the heady scent of the BBQ pecan smoke. The kind of smoke that doesn't sting the eyes but greets your nose and makes you hungry. Almost as soon as you climb out of your car you are greeted with generous wafts of the smell of pecan wood. You might even walk a little faster and pick up the pace when the rich smoke aroma startles your senses! Step inside and you will notice a classic old brick building from 1929 that is smartly renovated and modernized in the classic way. It’s reminiscent of a bygone era when Gilbert was an agricultural area. Booths and tables share space with a huge green farm tractor. A giant mural on the wall and other pictures show the agricultural theme. The line forms and you select your food, cafeteria style. The line can be long but moves quickly. So if you see a crowd no worries because it moves fast. This BBQ is amazingly tasty. Beef, pork, ribs, chicken... order what you want. The wood smoke and smells are divine. Make sure you try out their home made Root Beer because you will be surprised at the fresh flavor. And the music! They play some of the most pleasant old cowboy music from the days of the Silver Screen. Do you like music from the good ‘ole days? It will warm your heart and make you feel proud to be a part of the cowboy heritage. Here's a tip for your birthday. 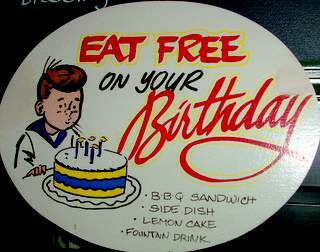 Come here with your driver's license showing your birth date and you will be treated to a free lunch! You could get a BBQ sandwich, side dish (I love the beans), lemon cake and fountain drink. Try their home made root beer, its remarkably tasty! Last time I noticed they give you 10 bucks worth of anything you want for your birthday! Baked potato loaded. Sandwich. You get the idea. Just come here for your birthday. Want another tip for your birthday? Go across the street to the Liberty Market and score a free dessert. I asked what is good and they sliced a gold flaked piece of chocolate cake! All you have to do is show your driver's license. You can get it to go for later, and for sharing. Felt like adult Halloween! Not sure how long this free stuff will last but they have been doing this for a long time. 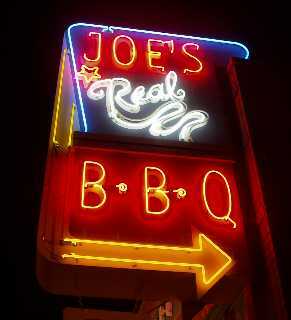 Where is Joe's Real BBQ?